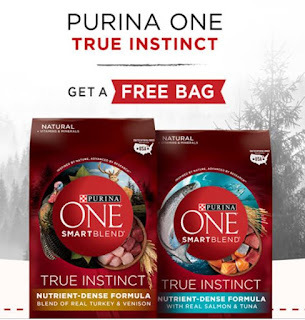 Free Bag of Purina One True Instinct Dog Food or Cat Food - NEW OFFER!!! Free Bag of Purina One True Instinct Dog Food or Cat Food - NEW OFFER!!! This page only works on computer or if on mobile you must do desktop mode in your browser. ALSO STILL AVAILABLE, THE OTHER OFFER FOR THE FREE PURINA. CLICK HERE IF YOU DIDN'T SIGN UP YET.